So brew your coffee however you normally do. Ryan makes french press for himself so he just made some extra for me. Chill that until nice and cold. 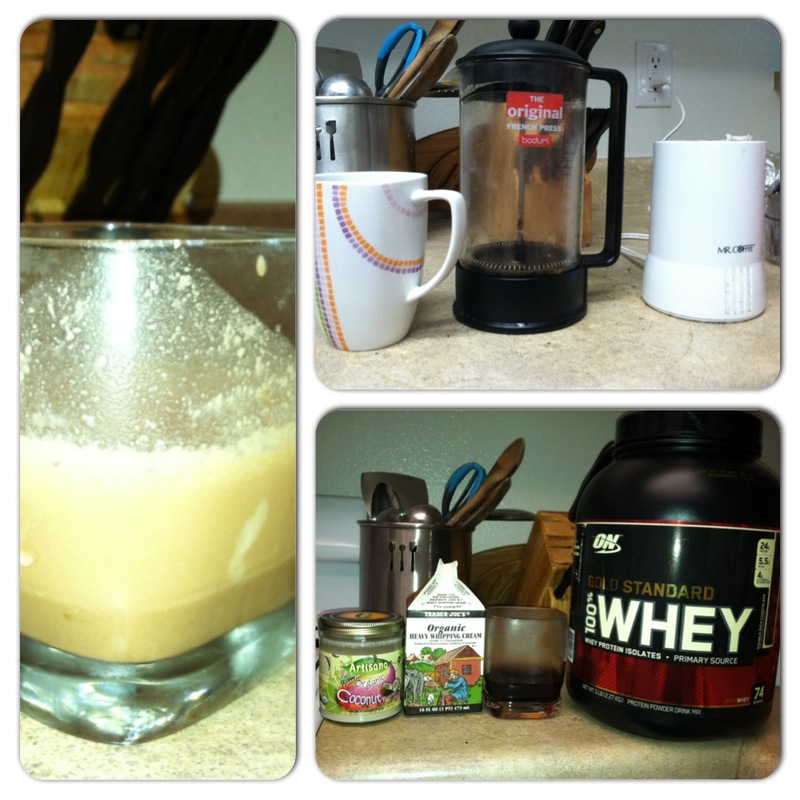 Then mix coffee, protein powder, water, cream and coconut butter in a protein shaker. My shaker has a little strainer like thing at the top which really helps break up the coconut butter and protein powder chunks. Then pour into another glass and enjoy! CHANGES FOR FRAPPUCCINO PROTEIN SHAKE: Sub in whole milk for cream and water…So instead of the 1/2 cup water and 1 tbsp cream, use a little over a half cup of whole milk. ALSO, add ice to the mixture in a blender instead of using the shaker and pulse till the ice cubes are broken down and the mixture is combined. I would use anywhere from a 1/2 cup to a full cup of ice depending on the size of your ice cubes. Cook the bacon. Remove once it is browned to your liking. 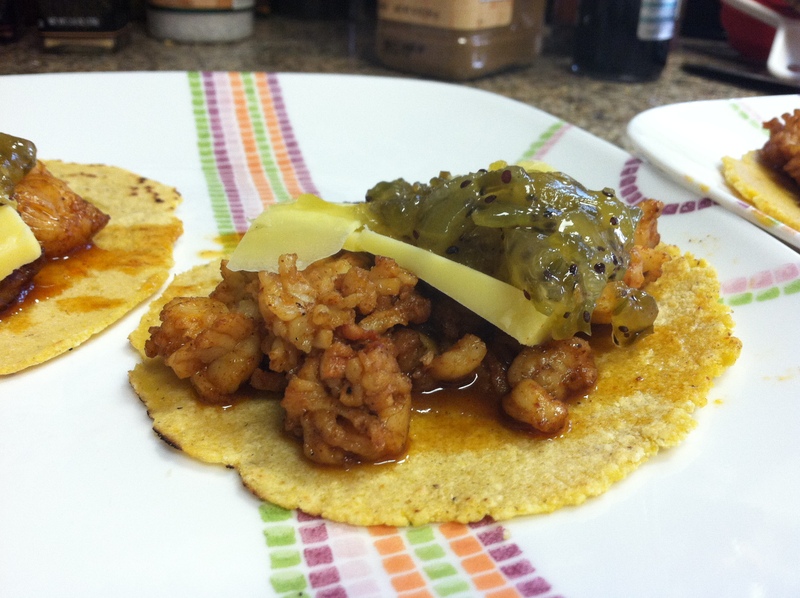 Using the bacon grease to then heat up your corn tortillas. While the tortillas are cooking up, mash up pinto beans. Remove tortillas once crispy and slightly brown. Put one tablespoon of beans on each tortilla. Sprinkle on jalapeños. Once you remove the tortillas, cook the eggs in the remaining grease. Once eggs are cooked to your liking, place on top of the beans. 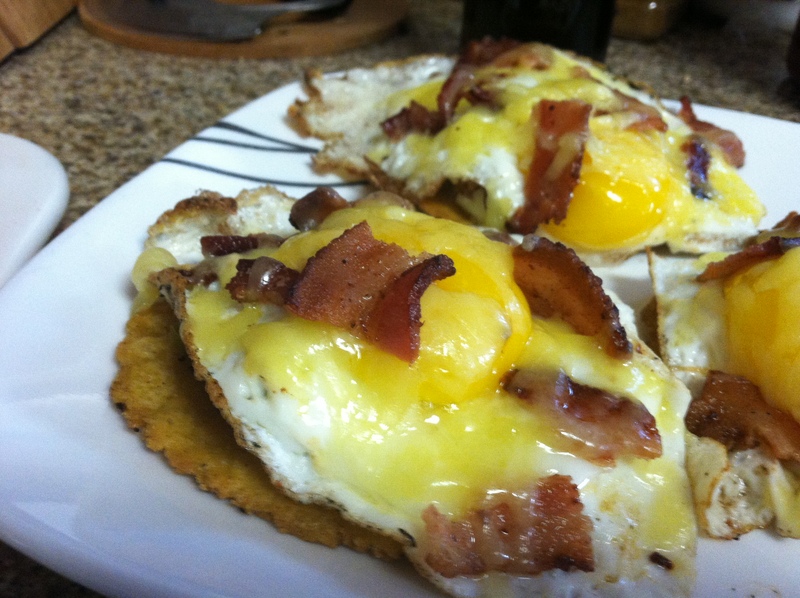 Top the eggs with bacon pieces and some cheddar cheese. Cook bacon bits in a saute pan. While bacon is cooking, de-shell lobster and dice. Season with cumin, paprika, cayenne and salt. When bacon is brown, remove bacon bits and add butter and lobster tail to pan. Cook until lobster is fully cooked and add bacon back in. Add bacon-lobster mix to corn tortillas. Top with a few thin slices of grass-fed cheddar and two tsp of kiwi-jalapeno relish. Serve warm with a side of your choosing. (We made a nice romaine salad with tomatoes, blue cheese and an olive oil, balsamic and dijon mustard dressing. Note: I linked out to the company that made the relish we got at the farmers market (All-natural ingredients! YAY!). I will be making my own though next time and will then post a recipe! Boil potatoes and cook the eggs. Crumble bacon into bowl with extra bacon grease (yum! haha). Chop up hard-boiled eggs. Peel the potatoes, dice and add to the eggs and bacon. Add in crumbled blue cheese, dill, cream, olive oil and mustard. Mix well and refrigerate till chilled. Combine all ingredients in a pitcher and let sit a few hours so that all the flavors have time to blend together. 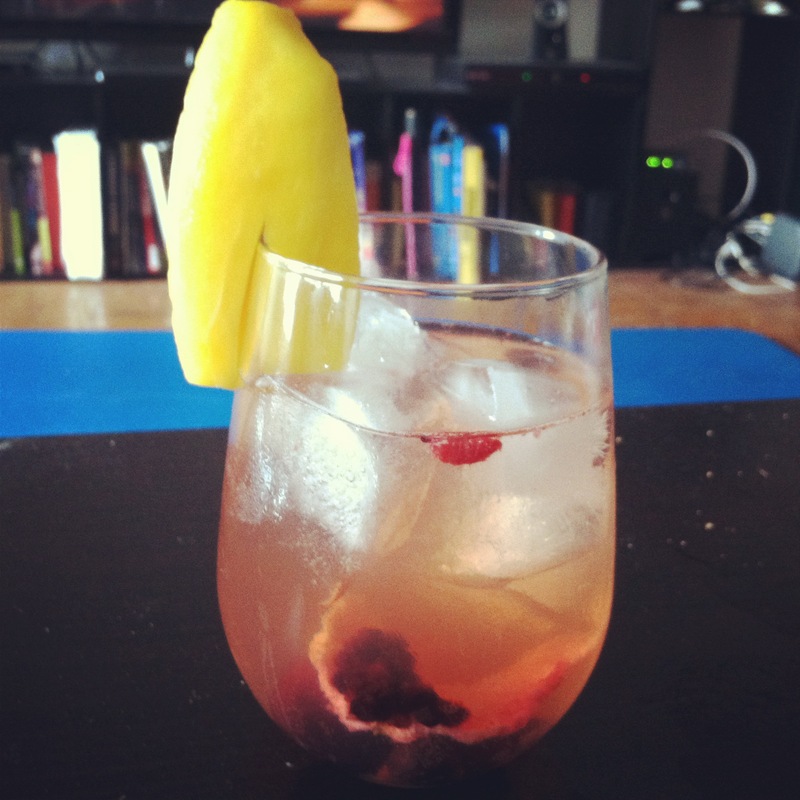 Serve chilled over ice! You get 4-6 serving out of this. So I made this hot dog with a parmesan crisp bun, but next time I would put the salad in the crisp and wrap the dog in lettuce. Cook bacon in pan until golden brown. Once bacon is cooked, remove from pan and cook hot dogs in the bacon grease. Once hot dogs are cooked, saute onions in remaining grease. Stuff hot dog, bacon, onions, ketchup and mustard into a lettuce cups. While bacon and hot dogs are cooking, make the parmesan crisps. Melt butter on a plate or bowl. Spread out parmesan cheese into an even layer on the plate or bowl. Cook in microwave until cheese starts to brown. Cool on paper towel. To form into a bowl, take the warm crisp and use bowl to shape sides. Make the queso dressing by combining cream, salsa and queso. Combine lettuce, olives and queso dressing and serve in parmesan crisp bowl. Cook bacon in a pan. Use the bacon grease to then cook the shaved steak with cumin, paprika, pepper and onion salt to taste. While steak is cooking, make the pico de gallo and guacamole. Diced tomatoes and onions. Combine in olive oil with a pinch of salt. Set aside to top salad. To make the guacamole, mash up the avocado, cream, salsa verde and garlic. 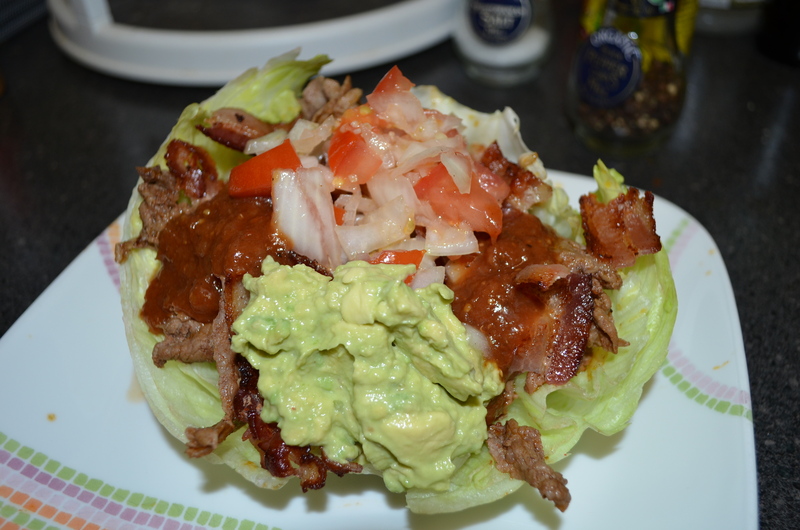 Place lettuce leaves on plate to make a “bowl.” Top with shaved steak, chopped bacon, pico de gallo, guacamole and some of your favorite red salsa. YUM! Cook bacon in pan. Use the remaining grease to cook ground beef. Season the ground beef with cumin, chili powder, adobo seasoning and garlic. While ground beef is cooking, make the parmesan crisps. See directions above in the Ball Park BLT recipe. Once parmesan crisp bowls are made and cooled, top with arugula. Add cooked ground beef and crumbled bacon on top. Combine mustards, ketchup, olive oil and onion salt. Top bacon and ground beef with sauce. I served this deconstructed bacon cheeseburger with brussel sprouts and onions cooked in grass-fed butter. Cook the bacon on medium heat in a skillet. Once cooked to your liking (I like mine crispy! ), remove from skillet and cool. While bacon is cooking, slice onions into thin half rings and slice up duck breast. Once bacon is done cooking, throw onions into the bacon grease to cook. Remove onions and then cook the duck breast in the same skillet. Cook the duck until each side is nice and golden. While the duck is cooking, cut a few slices of tomato and make the sauce. To make the sauce, combine brown mustard, ketchup, olive oil and yellow mustard in a dish. Stir until combined. 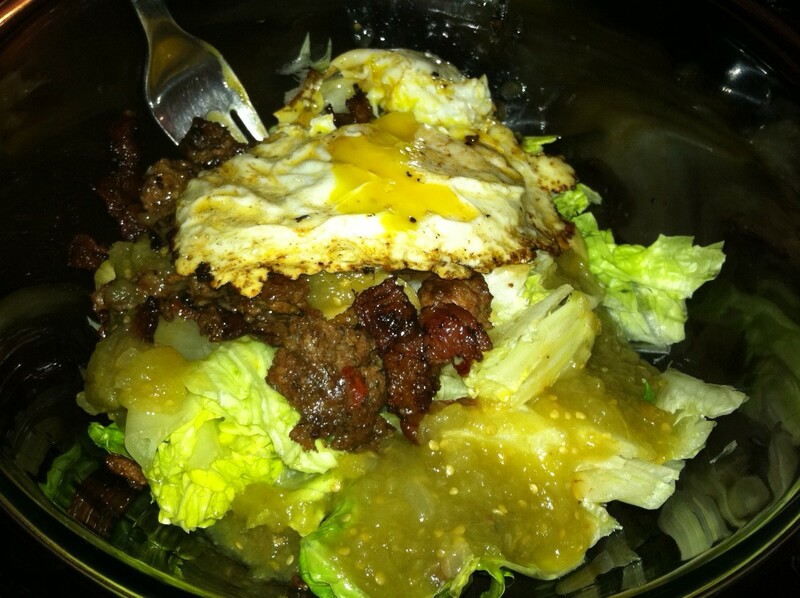 Place cooked duck into lettuce bowls. I used two lettuce leaves for each plate, but more can be used. Then pile on sliced tomatoes, bacon and onions. On top add the ketchup/mustard sauce. Preheat grill. Combine Lamb Merguez and ground beef. Form into about 4 oz patties. Once patties are formed, place onto grill. Cook about 4 minutes on each side or until desired temperature (aka medium rare, medium) is reached. 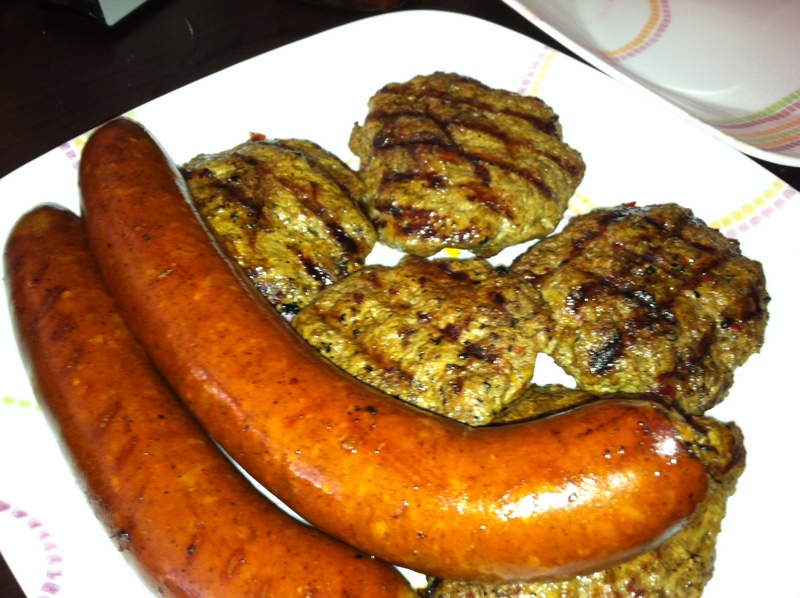 Place kielbasa on grill when you flip the burgers. The kielbasa is already cooked so you really just need to heat it and get some nice grill marks on it! While the patties and kielbasa are on the grill, cook bacon in a pan. Once bacon is crispy, add in blue cheese, ketchup and chopped green onions. Stir until combined and then transfer to a bowl. This is a great topping for the burgers! Of course no meal is complete without some veggies! 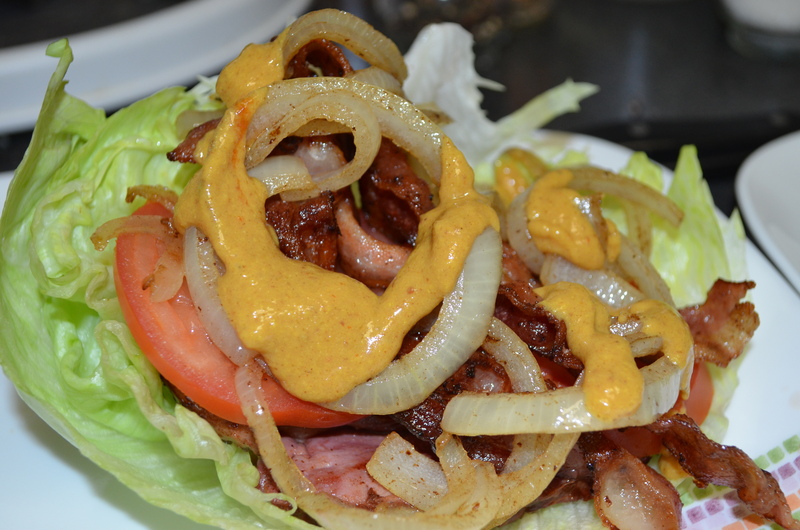 We made a nice little romaine salad with a creamy mustard dressing to go along with the burgers. Preheat oven to 350 degrees. 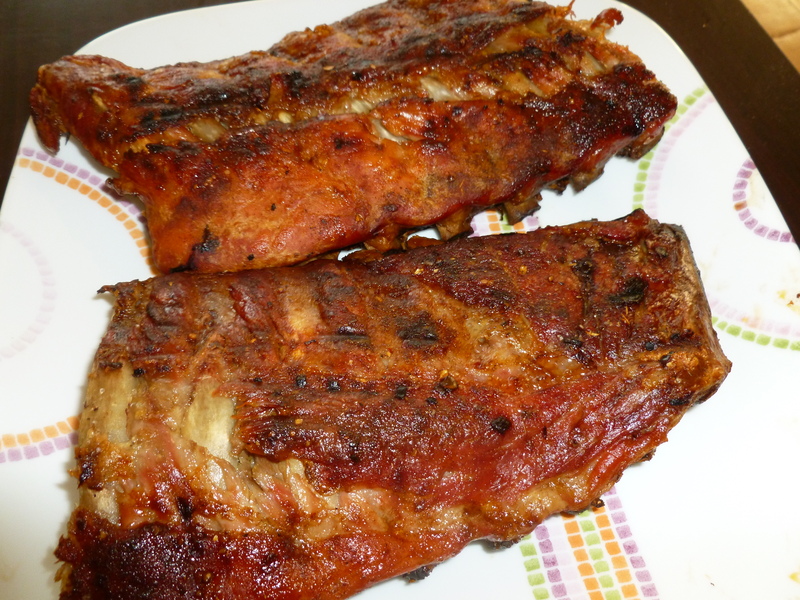 Place ribs in a 9×13 inch baking dish. Rub slab of ribs with seasonings on both sides. Put meaty side up and fill dish with cider. Cover and put into oven for about 1 hour 30 minutes. While ribs are baking make the sauce. In a pot over medium heat, combine tomato sauce, mustard, vinegar and molasses. Bring to a boil, stirring occasionally for about 5 minutes. Remove from heat and cool. Preheat grill when ribs are almost ready. Remove ribs from oven and coat both sides with the Kensington ketchup. Place meaty side up on grill and cook until both sides have a nice char. Serve with some of the tomato bbq sauce! First you must make the parmesan crisp bowls. On a plate melt a little butter and grease the entire plate. Cover with a 1/4 thick layer of grated cheese. Heat in microwave for about 1 minute 45 seconds until the parmesan is bubbly and golden brown. Carefully, remove crisp and place into a bowl covered with a paper towel. Press crisp to form to bowl shape. Cool and remove. I made two crisps this way. Then in a bowl, combine chopped lettuce, chopped olives and diced chorizo. To make the dressing, combine queso, 2 tsp cream, 1/2 tbsp salsa verde, and roasted yellow chili salsa in a dish. Once combined, toss with lettuce mixture. I topped the salad with a simple guacamole. I mashed avocado, 1 tsp cream, salsa verde, cumin and garlic together until cream. In a bowl, combine frozen berries and coconut milk. With a fork, mash together berries and coconut milk until only little chunks of fruit remain. I like to mash it till it is very blended. Then stir in cream and chocolate. We serve it in mugs but bowls work too! 😉 A delicious dessert if you are an ice cream lover! Ribs from The Meat House! YUM! Preheat oven to 350 degrees. Place rack of ribs in a baking dish. Rub with seasonings to taste. Place ribs meaty side up and pour in 1 can of beer around ribs. Cover the ribs with foil. Cook for around 2 hours checking tenderness after the first hour. After baking the ribs, we threw them on the grill for a few minutes to get a nice char on each side. In a saucepan, heat tomato sauce with mustard, cream and molasses. Bring to a boil then let simmer until it thickens a bit. If you like savory sauce, leave out the molasses. Depending on what I’m craving, sometimes I even make the sauce more mustard-y. 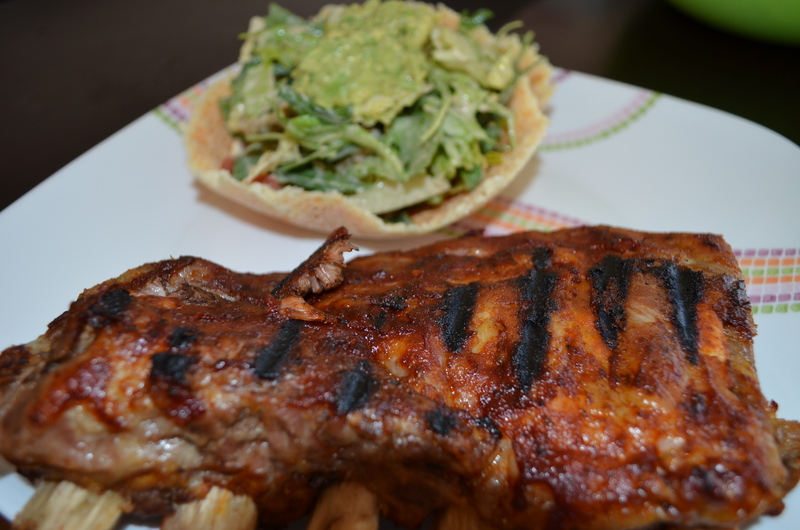 We served the ribs with a salad with a creamy mustard dressing (homemade!) and a Parmesan crisp! YUM! 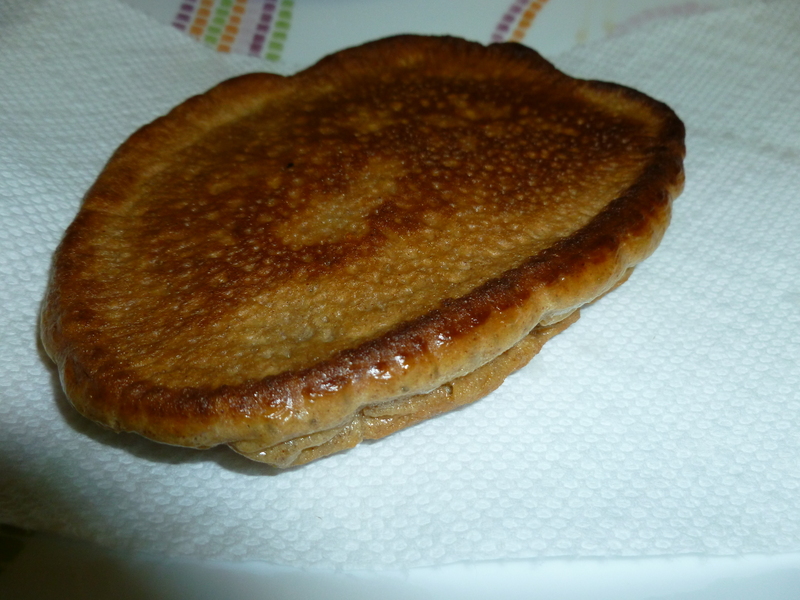 One pancake without any of the toppings. Whip cream and coconut milk together until the mixture starts to thicken. Add in cocoa powder and continue blending until the thick consistency of whipped cream (takes about 5-8 minutes depending on what level the mixer is on). If you need a bit of sweetness, add in a tsp of powdered sugar. I don’t find it necessary but it won’t kill you either! Our breakfast was also delicious. 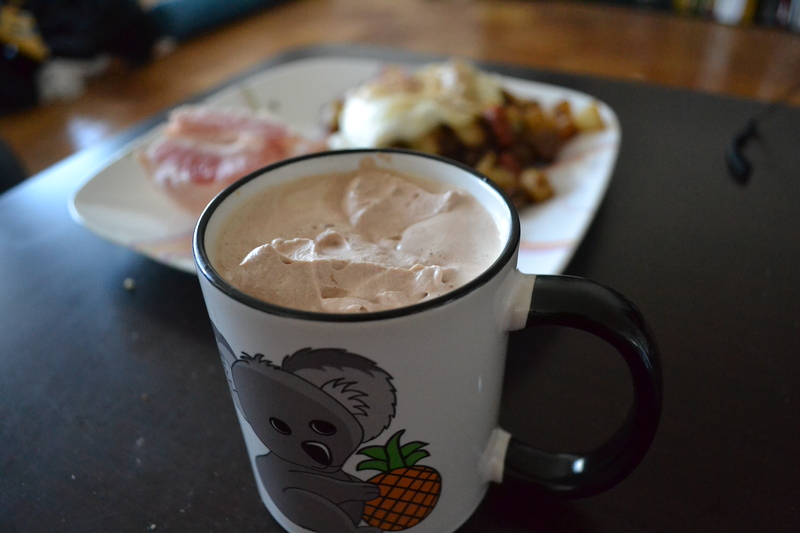 Occasionally, I add in potatoes on Saturday and today’s breakfast potatoes were delicious. 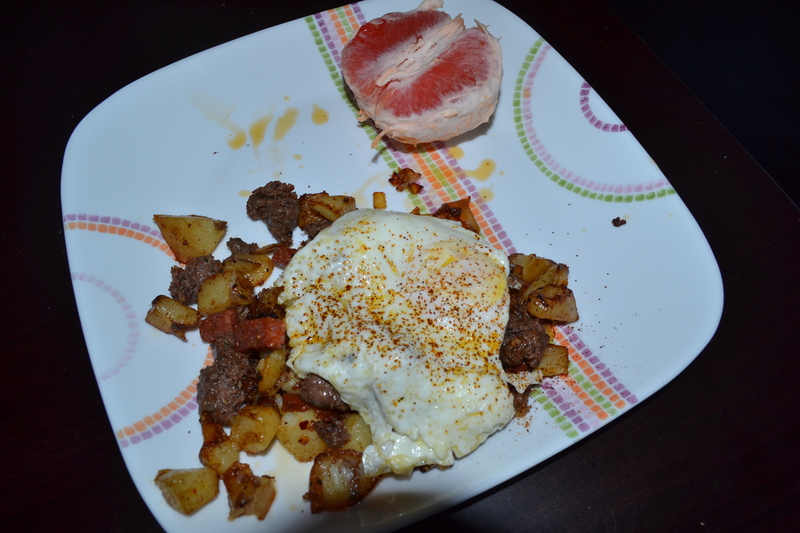 The Meat Lover’s breakfast potatoes and half a grapefruit. YUM! Brown the bacon and onion with cumin in a skillet. Add duck fat and potatoes. Once the potatoes start to brown, add merguez and chorizo. Once mixture is cooked, divide onto plates. Cook eggs in grass-fed butter and place over breakfast potatoes. Sprinkle with salt, pepper and chili powder. Ok so this doesn’t look beautiful but it tasted delicious! In a pan, heat bacon and onions. When onions are translucent, add in chopped potatoes. When potatoes start to brown a bit, add in the country sausage. Season with cumin, salt and pepper and add in wild boar salami. 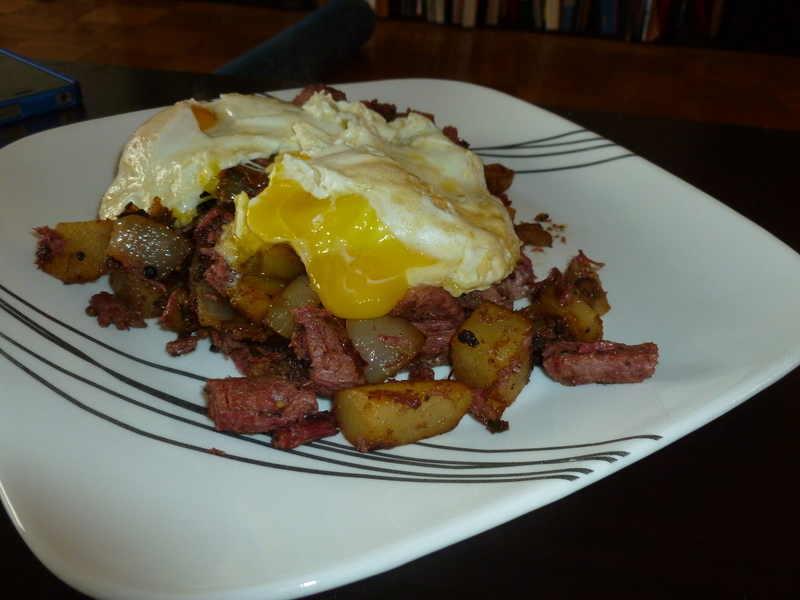 Once sausage is cooked and potatoes are golden brown and crispy, divide hash onto plates. Cook eggs in the same pan till over easy. 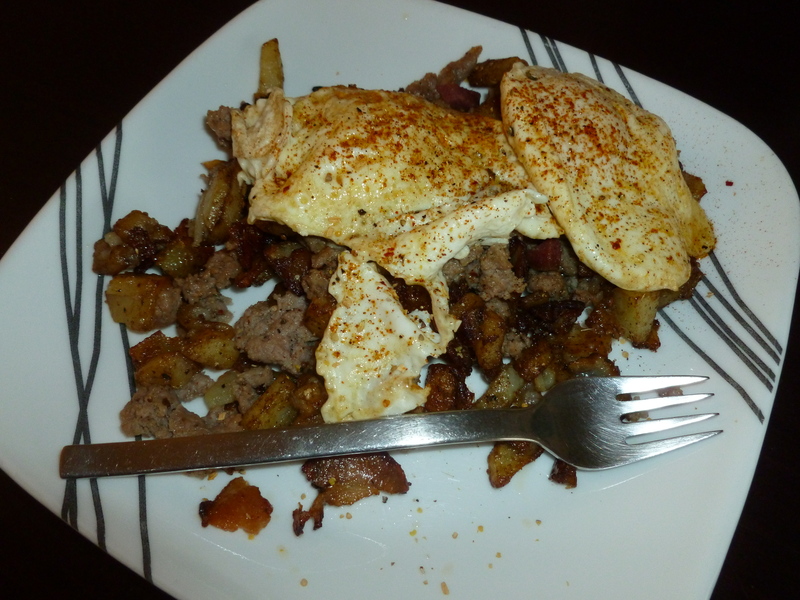 Serve over the hash with a sprinkle of chili powder. If you are looking to make this low carb, but equally delicious, cut out the potatoes. P.S. 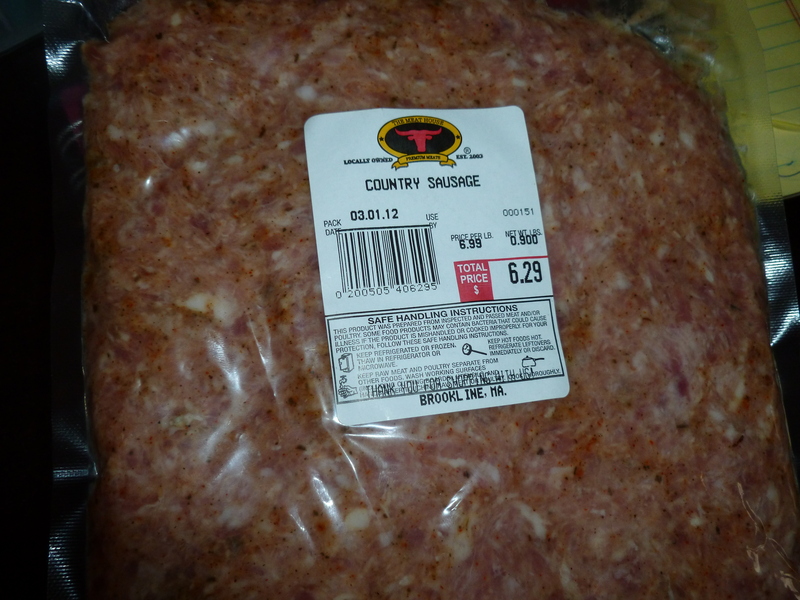 We use salami from The Meat House because it is nitrite free. AND all of their sausages are made in-house and have all-natural ingredients while being gluten-free!! Please don’t substitute in any sausage or salami as it will deduct from the nutritional benefit of the dish! Not the best presentation, but I wasn’t expecting to take a photo! So we went back to The Meat House in Coolidge Corner and grabbed some more of their homemade Lamb Merguez. Ryan made another breakfast out of it, which I will post at some point. There was some leftover on Monday still when I needed to throw together a quick dinner. This Leftover Lamb Merquez Salad took all of about five minutes to make and is perfectly Primal and loaded with good stuff! Cook bacon in a pan. When almost fully crispy, add in Lamb Merguez. While the Lamb Merguez is cooking, tear or chop up lettuce and put into a bowl. Once the Lamb Merguez/bacon mixture is fully cooked, add to lettuce. Then cook the egg in the pan with the bacon grease. I cooked my egg over-easy. Put egg on top of lamb/bacon mixture and add in chopped olives. Add salsa over the salad as a dressing. If there had been avocados, I would have also topped the salad with guacamole! Super quick and easy and you can definitely add in more vegetables if you have some around! So even though this salad didn’t look pretty, I posted it just to prove how easy it is to make a quick and healthy meal! 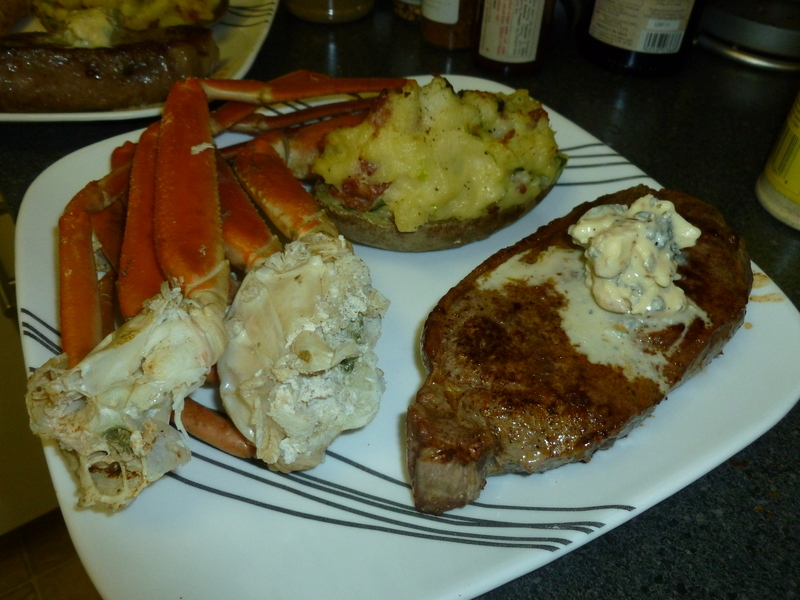 First make the blue cheese sauce by mixing together blue cheese, cream and pepper. Heat ingredients together in microwave about 1 minute. Make sure everything is melted together and then chill in refrigerator. Next start the steaks. Sear steak in pan with butter for 3 minutes. Flip over and finish in oven. Cook for about 7 minutes in the oven. Let the steak rest then top with blue cheese mixture. Steam crab legs over beer with Old Bay Seasoning for 20 minutes. Serve with melted butter. Bake potatoes in oven at 400 for an hour. Scoop out center of potatoes. Discard one of the potato skins. Mash the potatoes together with cooked bacon, chopped green onions, cheese, butter and cream. Add salt and pepper to taste. Divide the potato mixture between the two remaining skins. Put the overloaded potatoes back into the oven for another 10-12 minutes or until a little brown on top. 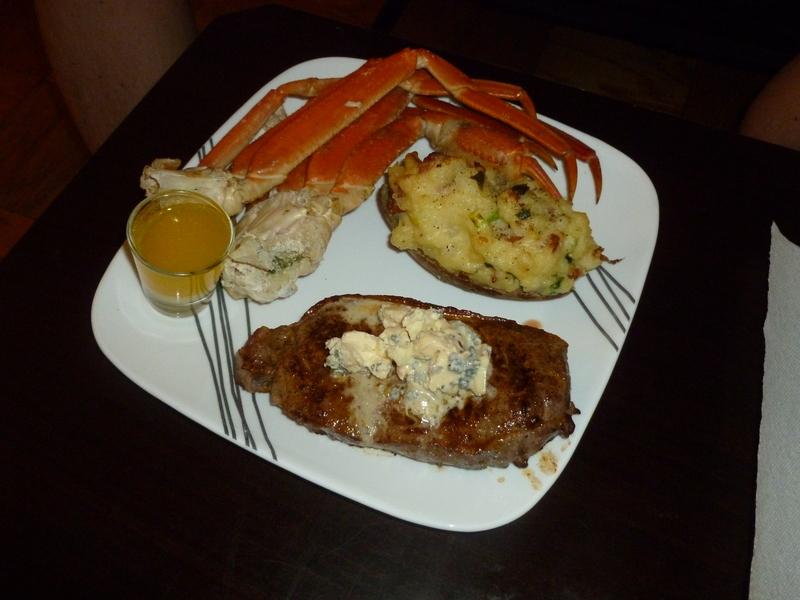 Set all the potato, crab and steak on a plate with the melted butter for the crab on the side. 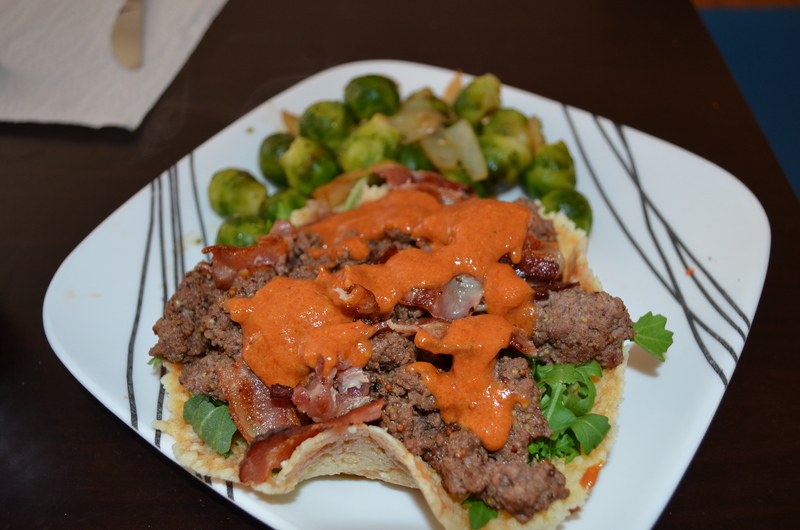 Now enjoy a great Primal date night dinner!! This is a great breakfast, or even a quick dinner, option. 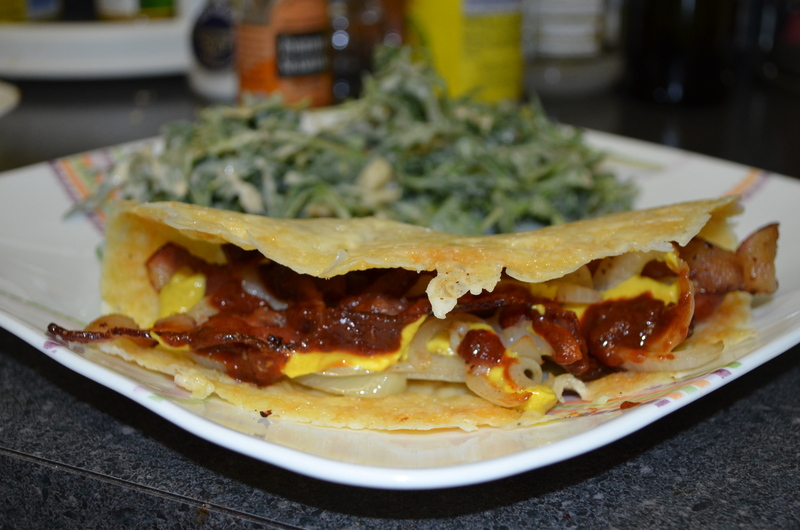 It takes about 15 minutes to make. Fully cook the Lamb Merguez and then add the smoked duck, eggs and salsas. Scramble together on medium heat. Then scoop the egg scramble onto a plate. Add some extra salsa, some cheese and a dollop of queso. Serve with a side of veggies or fruit! 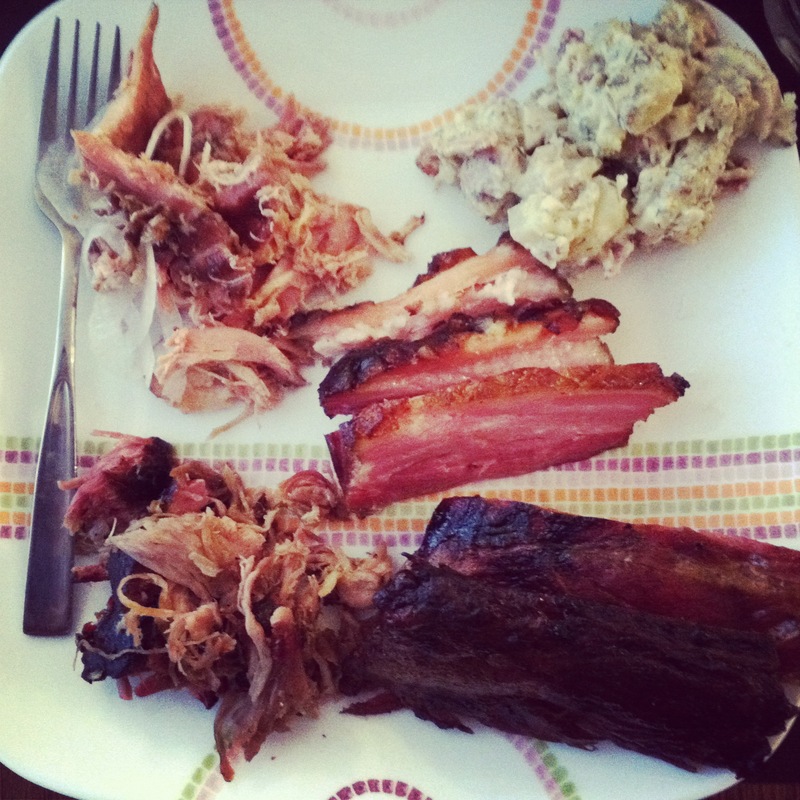 We use the Meat House and Trader Joe’s products because they actually are all natural. There are no vegetable oils or gluten fillers added to any of their stuff. The queso is also just salsa and full-fat cream cheese and cheddar cheese. The eggs are cage-free from Trader Joe’s as well. 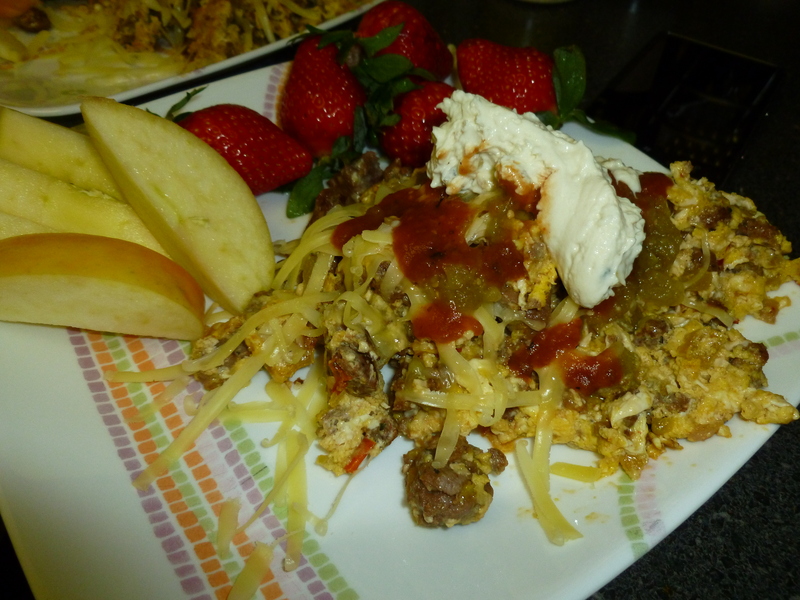 This is just one of Ryan’s wonderful breakfast scrambles…more to come soon!! It is a great option for a quick snack or breakfast! Add all ingredients to shaker and mix well! 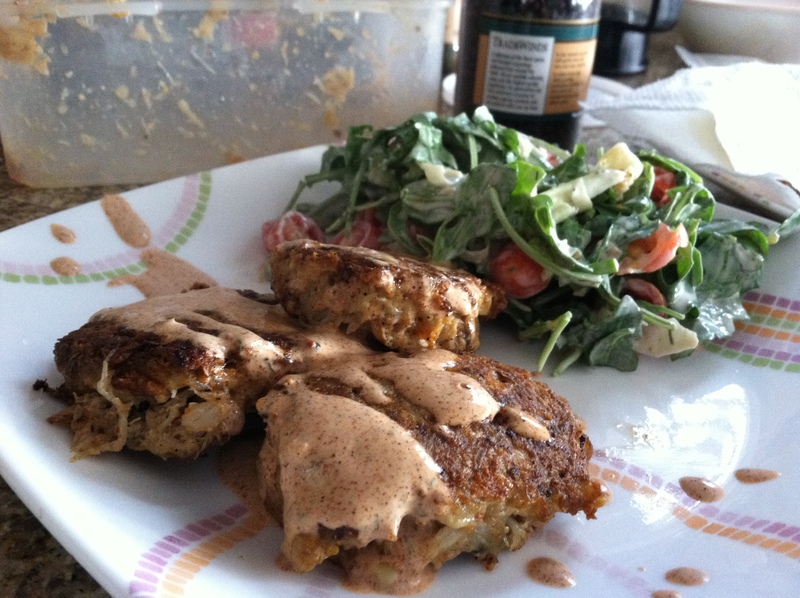 For this recipe, I use Trader Joe’s light coconut milk because it has nothing added to it. I also like Optimum whey protein. 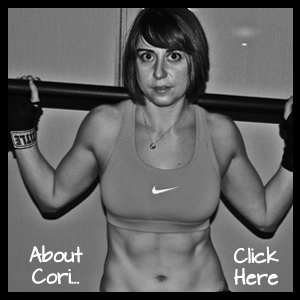 I like the taste and it doesn’t have any carbs.